“I wanted to write a political thriller,” to cover the factual story nobody else was covering, Clive Bloom tells Searchlight Magazine Arts over the phone from his home in London. Bloom is Emeritus Professor of English and American Studies at Middlesex University, author of numerous books, and is talking about his latest, Thatcher’s Secret War: Subversion, Coercion, Secrecy and Government, 1974-1990. He describes a time when the actions of the Security Services in Northern Ireland was “underhand, illegal and transferred over to the mainland,” where the intelligence agencies answered to nobody, and where a series of events “came together violently in wilful murder” – perhaps even with the killing of Airey Neave — escapee from Colditz and Conservative MP for Abingdon — who died in a car bomb attack in 1979. “What I do is present hidden histories,” explains Bloom, whose previous works have covered a diverse range of topics from cult fiction to the London riots. 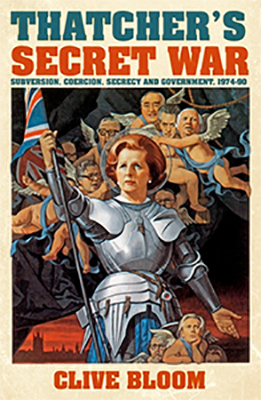 Now Thatcher’s Secret War aims to shed a new light on the years 1974 to 1990. “Margaret Thatcher and her supporters constructed a world where anyone against them was an enemy within,” he says. “She would have thought them mad,” he clarifies. This is an interesting point, but Bloom is keen to stress that the regime was not edging towards fascism. He does feel it was “edging towards out of control authoritarianism” though. Bloom thinks that although a lot has been written about this time period, his book is an important addition because it is a “story that people don’t realise happened.” As part of this he looks at Hillsborough, the fight against the miners, paedophilia, the sinking of the Belgrano and the reassertion of the class system. “I wanted to look very specifically at what people were doing,” he explains. “I tried very hard not to write a scandal or a conspiracy.” Yet he believes the legacy of all this can be seen through the Blair years when surveillance and opaque power structures became absolutely the norm. Thatcher’s Secret War: Subversion, Coercion, Secrecy and Government, 1974-1990 is available now and published by The History Press. Contact Clive at his website – www.clivebloom.com or via social media: @clivebloom and clivebloom/facebook.